I’ve been writing this blog for 3½ years. In blog years, that is like, eternity. I’m sure there are those who wonder, why bother? Why spend money to get it up and running and then hours a week on something that brings you no income, no direct contact with your audience? I can very easily tell you why. It’s reading about people’s favorite teachers which gave me so much hope about our new school and the upcoming year. It’s sharing some personal and kind of painful stuff and getting love and support in return. I often say this but sitting here in our little study, typing, watching the cars drive by, I most often feel that there are five people reading my blog. And then I share on a more personal level, and I am blown away by the support. So. Whether you are a first time reader, a first time commenter, someone who visits often and comments often or someone who has just commented for the first time, I want to thank you for being here and for supporting me, on many different levels. One more thing, before we move on to corn. The winner of the $50 Target gift card is comment #92 (randomly generated and coincidentally, the year I graduated college). Congratulations Jennifer! I will contact you to get your mailing address! Without further ado, I have to ask are you tired of corn yet? Is it possible to be tired of corn? Let’s talk about corn. 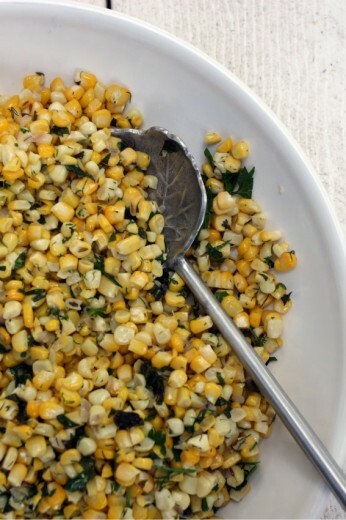 What is your favorite way to eat corn? Up until very recently, I would have said “boiled for three minutes, slathered with butter, showered with salt”. Because corn is pretty perfect that way. Especially if it is height-of-the-season farmers’ market corn. Which is the only time I buy it. Certain vegetables I buy all year regardless of the season. Broccoli, carrots, onions, potatoes, the usual. All of those taste pretty good to me whether I buy them in January or July. Tomatoes taste terrible in the winter but I need tomatoes in my life and yes I know they are a fruit. Corn and asparagus are things I eye warily in the produce aisle, suspicious of why they are there when spring and summer are one or two seasons away. But come late summer/early fall, I buy a lot of corn. I catered a party for about 40 people last week and as soon as I saw this recipe, I knew I needed it on the menu. I tested it several times beforehand and with one bite, I knew I had a winner. I’m sure there are some of you out there who stubbornly believe that you don’t need to do much to corn to make it taste good and I encourage those of you to realize that not much is actually done here. The corn doesn’t even cook for that long but the time it does spend in a hot pan, it is accompanied by a bit of butter, shallots, cumin seeds, and tons of herbs. Like, tons. The original recipe called for higher quantities of tarragon and dill, but I say use what you have. At this time of year, I always have a lot of bits and bobs of herbs floating around and I used them all. Cilantro, basil, tarragon, dill, mint, parsley, chives – all of them went in. We are coming to the end of corn season but before we do, please give this a try. The only herb I wouldn’t use here is rosemary – I don’t think its unique flavor would mesh well with corn. Fresh oregano is pretty strong if you are using that, just add a bit. If you are doubling this for a party of 40, use two sauté pans and prepare for it all to be eaten. Melt the butter in a large heavy skillet over medium heat. Add shallot and cumin seeds. Sauté until shallot is golden brown, about 4 minutes. Add corn kernels, 1 tsp. coarse salt, and 1 tsp. freshly ground black pepper. Sauté until corn is tender, about 5 minutes. Remove from heat and mix in all herbs. Season to taste with salt and pepper. We’ve been eating sweet corn almost every night. I can’t get enough. I can’t wait to try this recipe! Aaaaand I could face-plant this. I really can’t stop eating corn lately and with good reason…it’s really just perfect right now. I love it when it’s sweet enough to eat raw but I know it would also be great with all these herbs! The year you graduated college?! You are a youngster! 3 1/2 years that is wonderful!! I have only been blogging for a month and I absolutely LOVE it! Your blog is wonderful, going to try your corn! I read almost every post and have since the beginning. Sorry that I don’t post often just to let you know that there is somebody on the receiving end. You continue to inspire me to try new things. When we have our house warming party there will be many Dana inspired recipes on the dining room table. Perhaps this corn recipe! I do love corn and I am quite happy to eat it plain, but I am always up for new ideas. This one looks exceedingly tasty. I was just thinking the other day how summer is nearly over and I haven’t eaten enough corn! This looks delightful. I’ve been known to copy a Mexican treat and slather my corn on the cob with mayo and cayenne pepper (mmmm!). Will have to try this herbed variety. And p.s. Love that serving spoon! I know this is YUM~o! How good is the corn right now?? It’s just sinful. Do you think if you cut corn from the cob and then froze it, it would be alright to eat later? Or do you need to blanche it or something first? Your blog came up today for me two different ways…mentioned by one of my close blogger friends (Reluctant Entertainer) and then by Gojee…so here I am and I’m sorry I haven’t been here sooner! I love this post. I often ask why I blog still, it’s been over 3 years too…but it’s all the reasons you said. I’m so grateful to anyone who has ever read my words! I am never sick of corn…this is exactly how I like to eat it too! Lots of fresh herbs, yum! Beautiful photo and delicious recipe!!! Your blog is wonderful, and I’m glad you keep going strong after the eternity of 3.5 years! as to favorite way to have corn, I have to say I LOVE corn souffle. I know it’s overkill, but it’s one of our favorite dishes this time of the year. 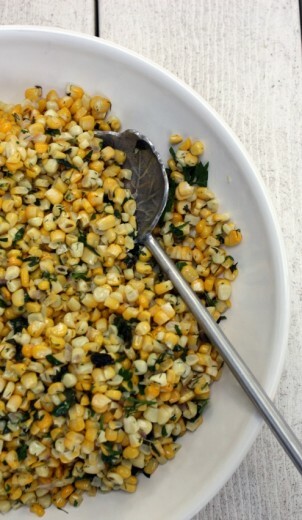 I use the basic master recipe from Julia Child, adapting for corn. I love corn this time of year and we almost never eat it off the cob. I slice those kernels off and do a quick saute with some butter, chili powder and lime juice – occasionally I add some parmesan crumbles – and it is eaten up seconds after we sit down at the table. This looks yummy too! Perfect. I have more corn from my CSA this week, and I was just going to boil it on the cob like I usually do. Nope, now I’ll be trying this tonight instead! 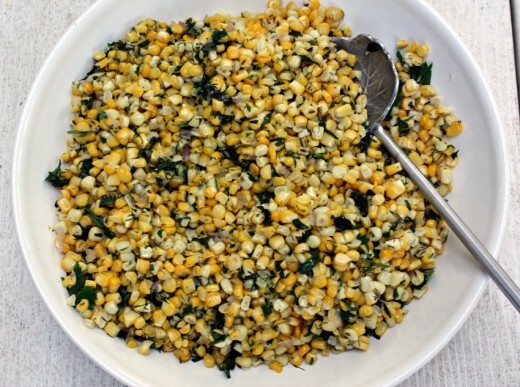 I am definitely never tire of corn and would love a big bowl of this. I love your serving spoon too!